I received an electronic ARC of this book from the publisher thru NetGalley for an honest review. The enchanting sequel to The Singular and Extraordinary Tale of Mirror and Goliath. Two orphans, Pedrock and Boo Boo, are sent to live in the sinister village of Darkwound. There they meet and befriend the magical and dangerous Mr Loveheart and his neighbour Professor Hummingbird, a recluse who collects rare butterflies. Little do they know that Professor Hummingbird has attracted the wrath of a demon named Mr Angel-Cakes. One night, Mr Angel-Cakes visits Boo Boo and carves a butterfly onto her back. Boo Boo starts to metamorphose into a butterfly/human hybrid, and is kidnapped by Professor Hummingbird. When Mr Loveheart attempts to rescue her with the aid of Detective White and Constable Walnut, they are turned into butterflies. Well, Ishbelle Bee has done it again. After my wonderful experience reading The Singular and Extraordinary Tale of Mirror and Goliath (I can truly only describe reading it as an experience), I was anxious to see where Bee was going to take both her characters and us, the reader, and I am tickled by the result. This time around, I feel like Ms Bee really let herself take off with the story; she has a much clearer idea of who the characters are that inhabit her world, and what a fine and madcap cast they are! Mr Loveheart is back this time, along with White & Walnut of Scotland Yard, and they are joined by a wild new group of characters: Pedrock and Boo Boo, orphans sent to live with their relatives in the village of Darkwound, where we also find Mr Loveheart and his various, colorful neighbors; Professor Hummingbird, a butterfly aficionado; and Mr Angel-Cakes, Boo Boo's mysterious, and possibly quite deadly, imaginary friend. Ms Bee has injected an entirely fantastic level of humor into her story, reminding me of Gail Carriger's books. Here again, the lack of explanation, just the necessity to accept the magic in her world is expertly wielded, and something that I'm very happy to see carried over from the first book. Her use of typography to express some of the action is still present, as well, something I'm very happy to see. This is something that I think works so well in her books, and I hope she continues using it, should there be more books. 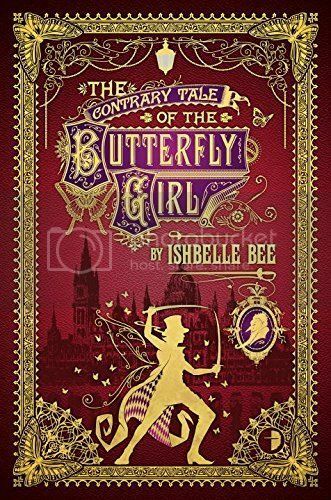 Needless to say Ishbelle Bee has completely won me over, and I can only hope that we have a great many more adventures with Mr Loveheart to look forward to! I need to take a moment again to comment on the cover! Somebody at Angry Robot is doing a bang-up job on these covers and book design, and I desperately wish that as we are given more adventures with Mr Loveheart, we are also given more of these gorgeous covers. Beautiful marketing, Angry Robot! Keep up the good work. Many thanks for your very kind words about our book design. I art direct our books, but the credit here must go to the might John Coulthart, who created Izzy's amazing covers.